A new horse article published in March 2015 by All About Cutting looks at horse abuse and if the issue is on the rise. Author Rick Dennis cites RateMyHorsePRO.com as one of the “best sources” for finding information on horse abuse cases. “This organization seems to have a remarkable and unlimited source of information gathering on this topic and readily brings it to the forefront of public awareness,” he says. Dennis’s career included horses and the law enforcement sector. He is also an author of multiple horse-related books. Do you want to protect your horse stable’s business, your bottom dollar, and your sanity? The Madison Equestrian Examiner delves into why you may want to consider vetting future clients if you run a horse boarding business. The author includes six methods business owners can use to help protect themselves. Rate My Horse PRO is included at the top of the list. The dust settled since the Arkansas five horse theft stunned nationally. Was it greed that didn’t allow Shaun Smith’s horse Credit Card to return home alive or something more sinister? A new book details the true crime that rocked horse lovers’ faith in humanity. The criminal ringleader and rodeo mom is serving a 60-year prison sentence in Arkansas. 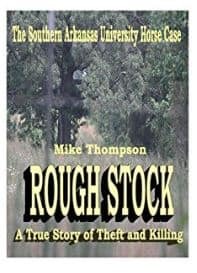 Rough Stock: The Southern Arkansas University Horse Theft Case is by Mike Thompson. He is a former criminal defense attorney located in Texas. The book explores the SAU theft of the college students’ rodeo horses in November 2011. They didn’t have to look far to find the culprit and fellow barrel racer Jaci Rae Jackson and her accomplices. The mastermind behind the plot was Jackson’s mother, Wendi Cox. Cox enlisted the help of her on-again-off-again boyfriend with a criminal history, William “Billy” Hamilton, and other lesser known players. The book details the investigation and reporting of the case. Readers indulge in new case details from the criminal case proceedings in Oklahoma and Arkansas. Never before seen documents, including the private letter from Shaun Smith’s father pleading with the Arkansas judge not to sentence Jackson to probation, but instead, to time behind bars, are made available for the first time. Shaun Smith owned Credit Card, the sorrel roping horse that was shot, had his throat slit and was dismembered by his captors.